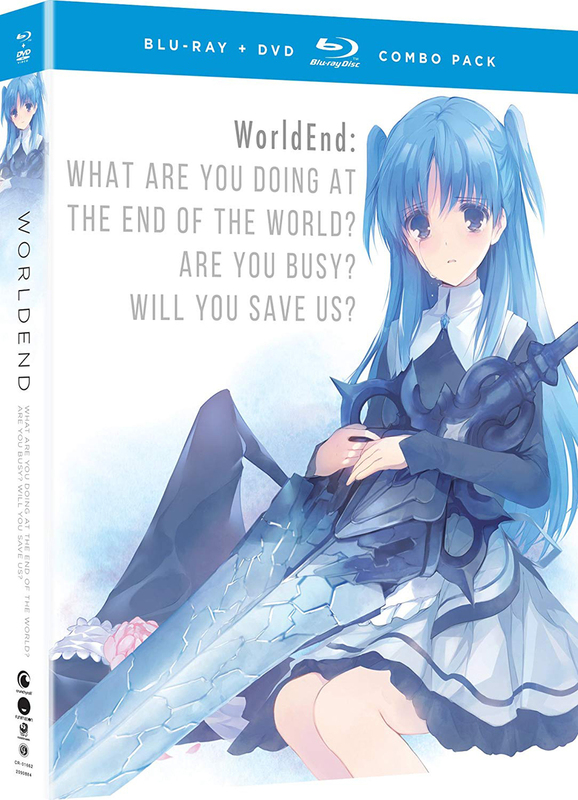 WorldEnd: What Are You Doing At the End of the World? Are You Busy? Will You Save Us? the Complete Series contains episodes 1-12 of the anime directed by Jun'ichi Wada. Petrified for five hundred years, Willem Kmetsch wakes up to find he has nothing left in a world where his kind is extinct—a world that sees him as unnatural. To survive, Willem takes on a job as a weapons caretaker only to discover that these are something more—they’re young leprechaun girls with the power to wield the mighty “dug weapons,” the only hope against the seventeen beasts. And they’re ready to die for their purpose. A fact that doesn’t sit right with Willem and leads him to care for the girls, especially the eldest, Chtholly. Soon, the girls begin to develop a desire to live and love until suddenly, something within Chtholly breaks. I partially got this anime blind. Based on the Trailer and a scene I remember seeing from a while ago after I watched this. To put it bluntly this honestly was a amazing anime. The main character felt he had nothing left to care for or purpose as he was the last human in the world. The Earth became ruin and beings that are human/animal-like take refuge on Sky Islands. I really enjoyed the story as a whole. It will hit you in your feelings throughout this. It is a sad story anime. But I think done in a amazing way! It Built up to the point of how everything came together. Why the earth became ruin, How it became that way, Who's to blame. Love confession. I will definitely Re-watch this!! This is a wonderfully made anime. From the art style to the music to the characters. You start to feel for the leprechauns as they become more "human" for lack of better words and emotions. If you love showes that were not main stream but still held their ground this is for you. Honestly THE best anime at the time of it's airing in year 2017. When the song Scarborough Fair played in the 1st few minutes of ep1, I became entranced. That flawless intro is how one captures the heart of their unknowing audience. At times it will make you smile and at others, it will make you sad. The two leads, Willem and Chtholly, and their relationship will no doubt captivate the heart of any viewer. No beating around the bush, no games being played, no anime cliche interruptions, just innocent, honest, and straightforward feelings being expressed. Something real people should learn from. Only the very basic world building is covered and a lot of crucial information is a mess. As in the 17 beasts actually being 17 beast species/races. The war Willem took part in was also confusingly described. I found this out after some research. Despite that though, this anime is a perfect 5 stars for how much it moved me and reminded me that there is beauty to be found in anime still.